Via ESPN.com: “Four more reporters came at the question from different angles — What would you tell your granddaughters? How does this help grow the sport? 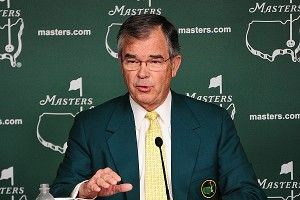 — to get [Augusta National Chairman Billy] Payne to expand on the topic. He politely swatted them away, preferring to talk about the weather, developments of the club’s digital platforms and other issues surrounding the tournament that starts Thursday. “Asked whether it takes away from the tournament when the issue of female membership surfaces in the lead-up, Payne also offered very little. It’s time for the Masters, you guys. A tradition unlike any other.